that continue to astound us year in and year out. "Mineral Treasures of the Midwest"
as you will see, is open to interpretation. Some really fine exhibits were there to be enjoyed. This year at TGMS, Crystal Classics had our biggest floor space ever. We were able to fit 17 show cases into the area together with six mineral specimen drawer units with a little room to spare. 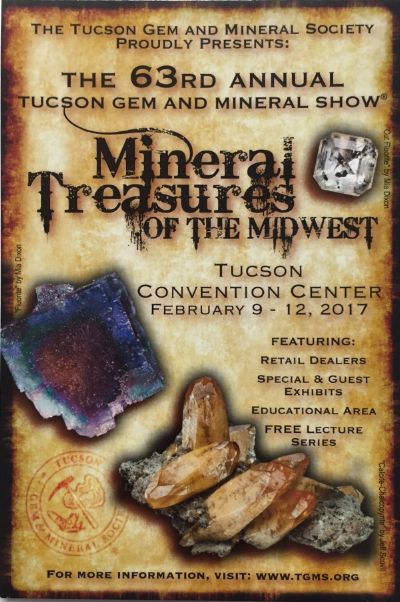 When the displays were completed the ambience in the booth was both comfortable and easy for collectors to view our great range of fine mineral specimens and chat with the team. Of course the bigger the booth the longer it takes to set up and the more team members you need. So we were ready to go at 7 am queuing for best spot outside the Tucson Convention Centre. Once the cabinets were in position the work displaying the specimens could begin. Debbie with Dave Hacker choosing those important first few specimens for display. Katrin Schlegel working on another of the show cases. Diana choosing specimens for the Fluorite display case. The drawer units ready for loading with specimens. Comfort during set up - always a good policy!! Just some of the boxes of minerals that had to be sorted for display this year. Ian Bruce getting stuck into the displays. Malcolm and Angela Southwood having fun creating the Tsumeb display Case. Terry Szenics ("Skip") enjoying some of the specimens Crystal Classics have to offer. One of the vertical "pillar" showcases completed. Just part of the finished display ready for customers and friends to see. A tradition for the Crystal Classics team - Lunch at the local Mexican Restaurant. Liz and Dave Hacker show their disapproval that there were no Margarita's!! The restaurant no longer had a licence for Alcohol. Mexican food without Margarita's ??? Some of the team returning to complete the displays. I have read about this fine Rhodochrosite but never seen it in the flesh. to be recovered from the Sweet Home Mine, Mount Bross, Alma District, Park County, Colorado, USA. This show case was presented by Penny Williamson and Paul Car of the University of Wollongong, Australia and titled "Minerals Treasures of the Mid-West Pacific (Australia)"
... and this fine example of Pyrosmalite crystals, also from Broken Hill, New South Wales, Australia. Eagle's Nest Mine, Sage Hill, Michigan Bluff District, Placer County, California, USA. This show case exhibited by the Smithsonian Institution had three items of fine gems and Jewellery. pendant of 18 carat yellow gold, created by Tiffany - early 20th century. polished specimens from the Joel F. Hauser Collection. Mineralogical Association of Dallas (MAD). the Waisanen Quarry (Tamminen-Waisanen Quarry), Greenwood,	Oxford Co., Maine, USA. The Smithsonian institution had another show case devoted to "Minerals of the Tri-State District"
Joplin, Jasper County, Missouri, USA. Eager collectors jostling between the booths. Rottleberode, Stolberg, Harz, Saxony-Anhalt, Germany. Cavradi Gorge, Curnera Valley, Tujetsch, Grischun, Switzerland. from Minerva No. 1 Mine, Cave-in-Rock, Illinois, Hardin Co., Illinois, USA. Diopside from Merelani was particularly eye catching..
from Merelani Hills, Lelatema Mts, Simanjiro, Manyara Region, Tanzania. 79 Mine, Chilito, Hayden, Banner District,	Dripping Spring Mountains, Gila Co., Arizona, USA. ...including this specimen from the Copper Queen Mine. Another show case devoted to Bisbee - Assorted Malachite specimens. Bisbee, Warren District, Mule Mts., Cochise Co., Arizona, USA. from 200 Level, Czar Mine, Queen Hill, Bisbee, Warren District, Mule Mts, Cochise Co., Arizona, USA. to a "Bird's Nest" of Aragonite "Cave Pearls", from Bisbee, Cochise County, Arizona, USA. Specimen collected by Ray Wright. The show case of the Harvard Collection with a few interesting exhibits..
One of four cute Fluorite specimens from Illinois showing some of its inclusions. Stambaugh, Menominee Iron Range, Iron Co., Michigan, USA. on display in the National Museum of Scotland show case. The Natural History Museum, London brought the Midwest of the USA together with the Mid and the West of the UK by incorporation West Cumbria, the Midlands and South West England in one showcase. From the case above, two "Amethyst" sceptre crystals. On the left a rare specimen from Copper Hill Mine, Sticklepath, Devon, England and on the right a "Sceptre" specimen of "Amethyst" perched on a Tourmaline included Quartz from Little Pipestone Creek, Jefferson County, Montana, USA. of Fluorite from Florence Mine, Egremont, West Cumberland Iron Ore Field, Cumbria, England. Sphalerite to name just some. from Rosiclare Level, Illinois - Kentucky Fluorspar District, Hardin Co., Illinois, USA. The end of the day and only a few hardened souls remain. It's not all rocks at the TGMS. A grand selection of books and magazines can also be found on many stalls. Well that's it for another Tucson. We hope that there has been something in our reports to interest all. There is, as always, so much to see and we cannot possibly cover everything. this time next year when we will have a completely new range of great mineral specimens to offer. In the mean time we have more venues to visit this year ....Ste. Marie, Denver, Munich. We hope to see all our friends at one or all of these forthcoming events. East Coker on 3rd June 2017.